The Raven Age are Michael Burrough on vocals, George Harris and Tony Maue on guitars, Matt Cox on bass and Jai Patel on drums. NI ROCKS – Hi George. Thanks for taking some time to talk to us at Rock Radio NI. I just played the track “My Revenge” from your album “Darkness Will Rise”. Can you tell us something about that track? GEORGE – That would be one of the heaviest tracks on the album and it’s kind of dark in terms of what the track is about. We actually decided to go with some heavier vocals around the intro part to give it that dark dynamic. We don’t usually do that on our tracks. The interesting thing is I knew a guy called Tony who was very good at screams in his last band and he came and recorded those vocals for us. It turns out that only a few months later that he ended up joining our band as a guitar player and he is on tour with us now. NI ROCKS – “Darkness Will Rise” was your debut album which was released in March. Where was that recorded and who did you work with? GEORGE – It was recorded in Essex and we worked with Matt Hyde. He’s actually worked on our EP before that so we had a relationship with him, knew how he worked and got on really well with him. He was really open to our ideas and we liked what he was coming up with. Basically, I really liked his sound. He has worked on some mega albums with bands that we’re influenced by and that was the reason we hooked up with him in the first place. “Darkness Will Rise” was a pleasure to write, but it took us a very long time to actually get the album recorded because we were doing a little bit, then we had a tour come up and we had to come back to it and finish it. Then it ended up being released a lot later than we had originally planned; but we were happy with the outcome at the end and were glad that we waited because it worked out well. NI ROCKS – That was actually my next question. It was originally to have been released in December last year but it came out in March, so that was the reason for the delay? You were just too busy? GEORGE – Yeah we had originally hoped to release it then and have it out for Christmas, but the label came along and they had a plan in mind for the release – press, signing deals, contracts and all that kind of stuff. It took all that time to get things in order. We thought that was obviously a good opportunity but we’d already communicated that we would release it in December, so we had to put a little ‘Sorry’ message out and waited another couple of months. NI ROCKS – In terms of writing, is that something that the band are doing on an ongoing basis or was there a focused writing session ahead of going into the studio? GEORGE – It’s a bit of both really. We write as we go. Straight after “Darkness Will Rise” it wasn’t like we’d just stop and leave writing; we’re constantly coming up with riffs and ideas. We’ve plenty of stuff written already, potentially for the next record, though it won’t necessarily make it onto it. We’re constantly writing loads on the road. We’ve got these little amp things that we use and we muck around whenever we can; that’s a favourite part of our process. NI ROCKS – Is there a common approach to it or does track develop in different ways? GEORGE – I guess we have a bit of a system. Not intentionally. It always stems from a riff – from a guitar riff or an idea we have that might sound like a good chorus – and it’ll branch out from there. We always get the music down first and try and get that as good as we can. Then we’ll look at getting the lyrics written on top of that. NI ROCKS – You’d released a 4 track EP back in 2014 – three of those tracks are included on “Darkness Will Rise”. Did you re-record or re-work those for the new album? GEORGE – Yeah, we didn’t rerecord the whole track, but we re-recorded the guitars. There was a bit of time between the EP and the album and we liked the tone we were using on the album a little bit more so we re-recorded the guitars as we wanted it to fit in with the rest of the tracks on “Darkness Will Rise”. So we did that and remixed and re-mastered them so that they flow a little bit better within the album. NI ROCKS – We’ll play another track from the new album now. Do you want to pick a track and tell us something about it? GEORGE – Let’s pick “The Dying Embers of Life”. This is the latest single we’ve released and we did a music video for it as well, fairly recently. It’s a different one on the album, it’s a bit more of a ballad. It’s had some good reactions – it’s very different from the rest of the tracks, but I like it. It’s actually one of the tracks that I wrote myself, so it means a lot to me in that sense. I actually wrote the concept before the song came. I did a visit to Alcatraz Prison and met an inmate there who wrote a book. I read his autobiography and got the idea of being trapped in a place overlooking everything that they want and they can’t get out of that place. That is what the song is written about and we’re playing it on this tour now. NI ROCKS – You’re playing in Birmingham tonight and then onto London and Bristol before dates in Dublin and Belfast next week. How is the tour going so far? GEORGE – Really good. We’re the third gig in. Manchester and Glasgow we’ve just played and they were incredible. It’s just a really different experience for us as we’ve always been the support band. It’s really strange; we’re quite used to it. People are wearing our shirts and they know all the words and want to meet us. It’s a bit over-whelming, but absolutely lovely. It’s great to get a lot of adrenaline off the crowd. NI ROCKS – Have you played Dublin or Belfast previously on any of your support tours? GEORGE – Yes, we played with Mastadon in both and played with Gojira there as well. We played at The Limelight in Belfast and The Academy in Dublin. Really cool shows and looking forward to getting back. NI ROCKS – What are your recollections of the Belfast fans and Belfast in general? GEORGE – We had quite a tight schedule then. We got off the ferry and got there fairly late on, did the show and then had to move on. So there wasn’t any time to explore. This time around we’ll have time to wonder around and see the city. 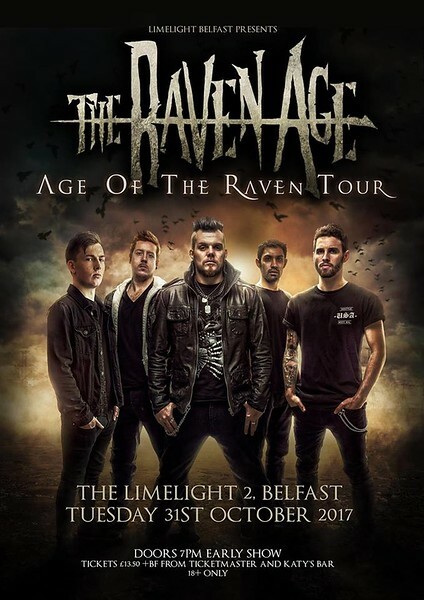 NI ROCKS – The UK leg of the “Age of The Raven Tour” ends in Belfast next Tuesday. Where does the tour continue onto after that? GEORGE – After that we head across to Europe and we start in Tilburg in The Netherlands, which is going to be a cool show. Then we go onto Germany for four shows, including my birthday in Munich so that’ll be cool; we’ll be able to go out and have a couple of drinks in Munich. Then we head to Paris and then into Scandinavia, playing Denmark, Norway and Sweden. Then back home. NI ROCKS – And what plans does the band have beyond the current tour and into 2018? GEORGE – We’re looking forward to doing a new record at some point. We’re getting ideas together and going through all of our demos that we’ve put down since the last album came out. We’re pretty unsure about a release date and all that sort of stuff. We’re hoping to do a load of festivals in the summer and that’s all I know at the moment. Lots of ideas floating around, but nothing set in stone. NI ROCKS – We’ll play another track from “Darkness Will Rise” now. Again, I’ll let you pick a track and tell us something about it. GEORGE – “Promised Land” is the opener on the album after the intro, which is a bit different from what we had originally planned. We had it in our heads to do the big epic intro and then crash into a fast song. But this one is a little different. It has a little more of a groove orientated riff and a kinda head nodding groove to it. “Promised Land” in terms of the lyrics is basically about the idea of success. People say if you work harder at something then you’ll be successful, but in our business that isn’t always the case. You just don’t know what is going to happen. You could work your nuts off and never actually get anywhere. The song is about the journey that we’re going through at the moment basically; all the ups and downs and every now and again having these doubts – are we good enough, are we going to do this? It’s about persevering through those doubts. NI ROCKS – You founded The Raven Age in 2009 with fellow guitarist Dan Wright who has now moved into management. It was about five years until you released the first EP – was that period spent just getting the band together and establishing yourself ? GEORGE – Myself and Dan started it as a bit of a muck-around; well not a muck-around, just a bit of fun as we both listened to similar kinds of music and just wanted to have a jam. We were doing that for ages and were happy with the way it was going so we thought we’d get some other guys involved and make a band. It took quite a while just to find the rest of the guys and we did our first show in February 2013 I think. It’s just gone from there. In 2009 it was just me and Dan playing in a room and we could barely play a guitar and now we’re on a headline tour it’s really crazy. NI ROCKS – What bands were influencing you when you formed The Raven Age and did you have a definite idea what you wanted the band to sound like? GEORGE – Not really. It’s hard to answer that. It was so natural. We were influenced by a lot of metalcore bands like Killswitch Engage, Trivium and Bullet For My Valentine; those kind of bands. When I was 14 or 15 those were the sort of bands we looked up to and got excited about going to see when they came to London. I think we were naturally influenced by them musically, especially as we were both guitarists and they were guitar driven songs. The only thing we decided to do, which was actually planned was to have singing, like clean vocals instead of scream vocals. We listen to a lot of bands that do that and we like it ourselves, but we wanted to do something a little bit different rather than just copying the bands that we were into. Try to do something a little bit unique basically. NI ROCKS – A couple of questions now that I like to ask my guests on the Show. Can you remember the first gig that you bought a ticket for and the first album you bought? GEORGE – The first show I bought a ticket for; I went with my cousin to see Audioslave at Brixton Academy, which was really cool and I really enjoyed. The first album I bought, I was probably a bit older than most people when it comes to this, but I went to HMV because I got a voucher for Christmas or something. I went and bought Deftones “B-Sides and Rarities”, (laughs)which is a strange first one I guess, “Frail Words Collapse” by As I Lay Dying and “They’re Only Chasing Safety” by Underoath. They were the first three I bought. NI ROCKS – And then the most recent gig that you went to, other than one of your own, and the last album that you bought? GEORGE - We went to see Papa Roach when they came to London a couple of weeks ago – that was pretty cool. And we’re going to see Five Finger Death Punch in December and I’ve just booked tickets for The Architects in January. The last album I bought must have been Parkway Drive’s latest album “Ire” – that was quite a while ago actually, I haven’t bought anything recently. I got Trivium’s album on my phone, but not a physical CD. NI ROCKS – Does each of the band members have their own musical preferences and who gets to control the music played on the tour bus or whatever? NI ROCKS – We’re now approaching the end of 2017, what would you hope to have achieved with the band by the time we get to the end of 2018? GEORGE – You know, I’m not sure. We’ve already achieved a lot; even with this headlining tour, it’s really cool. I guess I’d just like to keep at it and grow the band even more and perservere. If we sustain being in a band, earn a basic living and play music that would be absolutely ideal. If we can just do the same again and get a few more support tours maybe and do another headline tour that would be great. Just keep going, that’s the idea. NI ROCKS – That’s all the questions I have for you, I’ll let you get back to preparing for your gig tonight. Before you go though can you pick another track from the album to tell us about before we play it. And also pick an Iron Maiden track for us to play later in the Show. GEORGE – “Salem’s Fate” – it’s a lengthy one, but that was the first official single we released from the album. We recorded a music video for that as well, which is quite cool. It’s about the Salem witch trials and we tried to recreate Salem as best as we could with all the costumes and that kind of thing. That was good fun making that video. And it seems to go down well live, especially when we’re supporting someone and people put their lighters or phones up. It seems to go down well. Everyone in the band says that is one of their favourite ones to play. And Iron Maiden, we’ll go with “Blood Brothers”, I do like that song. NI ROCKS – Thanks for taking the time to talk to us; I’ll see you on Tuesday night!